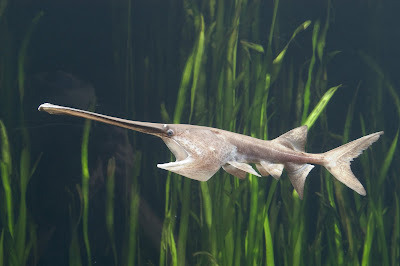 People experience the world through five senses, but sharks, paddlefishes, and certain other aquatic vertebrates have a sixth sense: they can detect weak electrical fields in the water and use this information to detect prey, communicate, and orient themselves. A study published online on October 11, 2011 in Nature Communications caps more than 25 years of work and finds that the vast majority of vertebrates – some 30,000 species of land animals (including humans) and a roughly equal number of ray-finned fishes – descended from a common ancestor that had a well-developed electroreceptive system. This ancestor was probably a predatory marine fish with good eyesight, jaws, and teeth, and a lateral line system for detecting water movements, visible as a stripe along the flank of most fishes. It lived around 500 million years ago. The vast majority of the approximately 65,000 living vertebrate species are its descendants. "This study caps questions in developmental and evolutionary biology, popularly called 'evo-devo,' that I've been interested in for 35 years," said Dr. Willy Bemis, Cornell professor of ecology and evolutionary biology and a senior author of the paper. Dr. Melinda Modrell, a neuroscientist at the University of Cambridge who did the molecular analysis, is the paper's lead author. Hundreds of millions of years ago, there was a major split in the evolutionary tree of vertebrates. One lineage led to the ray-finned fishes, or actinopterygians, and the other to lobe-finned fishes, or sarcopterygians; the latter gave rise to land vertebrates, Dr. Bemis explained. Some land vertebrates, including such salamanders as the Mexican axolotl, have electroreception and, until now, offered the best-studied model for early development of this sensory system. Researchers at the University of Colorado Cancer Center have developed a test that identifies a key biomarker in advanced lung cancer that helped reduce the risk of death by 36 percent over a 30- month period in a recent clinical trial. "We are moving from a one-size-fits-all model to more personalized medicine in lung cancer," said University of Colorado School of Medicine Professor Fred R. Hirsch, a Cancer Center investigator who developed the test along with colleague Dr. Wilbur Franklin. "This is a completely new paradigm in treating cancer." The test was developed in 2003 when Dr. Hirsch and his colleagues created a scoring system ranging from 0 to 400 that identified patients with the highest levels of the protein Epidermal Growth Factor Receptor (EGFR). Those scoring over 200 had a better prognosis. A clinical trial held in Europe known as the FLEX-study, found that 30 percent of the advanced lung cancer patients who took part had high levels of the EGFR protein identified by the University of Colorado Cancer Center test. The trial consisted of 1,125 advanced lung cancer patients separated into two groups. One group received standard chemotherapy while the other had chemotherapy along with the drug cetuximab, an antibody that attaches to EGFR receptors atop lung cancer cells and often inhibits their growth. The results were announced at the 2011 European Multidisciplinary Cancer Conference in Stockholm. Using the Cancer Center test, the trial showed that Caucasian patients with an over expression of EGFR and treated with chemotherapy and cetuximab had a 36 percent reduction in deaths compared to the other group. Cetuximab, or Erbitux, is primarily used to fight colo-rectal and head and neck cancers. Dr. In the two years since Iowa State University's Dr. Adam Bogdanove, along with student Matthew Moscou, published their groundbreaking gene research in the cover story of the journal Science, researchers around the world have built on those findings to explore further breakthroughs. Science has published another article by Dr. Bogdanove in its September 30, 2011 issue that updates the scientific community on where the research has been since 2009 and where it is heading. "In the past two years, an extraordinary number of things have happened in this field," said Dr. Bogdanove, a professor of plant pathology. "This is really pretty revolutionary." Dr. Bogdanove's research published in 2009 uncovered how so-called TAL (transcription activator-like) effector proteins bind to different DNA locations, and how particular amino acids in each protein determine those locations -- called binding sites -- in a very straightforward way. Knowing this, scientists are using the proteins to target and manipulate specific genes, something that was much more difficult to accomplish prior to this research. That could lead to breakthroughs in understanding gene function and improving traits in livestock and plants, and even treating human genetic disorders, according to Dr. Bogdanove. He says that in the two years since his and Moscou's work was published, nearly two dozen research papers have been published using this discovery. "We are so excited about the potential of these proteins. Just in the past six months, they have been used successfully in model organisms such as yeast, zebrafish, and C. elegans, and even in human stem cells. There is some really innovative stuff going on," he said. Dr. Bogdanove collaborated on this Science article with Dr.